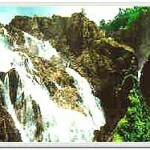 Putudi Falls is situated 15 km from Phulbani. The natural beautiful of the Putudi Falls on the river Bada Saluki, with dense forests and hills on either side have entranced visitor over the ages. This entry was posted in Orissa, Putudi. Bookmark the permalink.